It felt like it might never get here but Summer has officially arrived and we welcome you with open arms. We have lots of colourful, cheerful and useful summer items to help with your entertaining. It's a great time to pop in that colour, change out a piece of furniture, add a fab lamp, hang a piece of vibrant art and then sit back with a cool drink and admire your handy work. We spend a lot of time outside creating our outdoor extended living areas but its always gratifying to walk back inside to a space that makes you feel happy and content. Whether you are hanging around the house, the balcony or heading to the cottage this summer there's something here you are bound to love. We experience the love factor every day at the store. Indulge in the new arrivals and don't wait if you love something! We've got a new video this week. Do you know what an Epergne is? 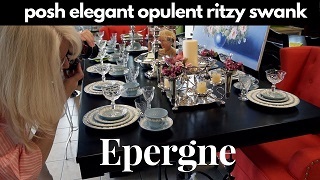 Epergnes are centrepieces but not just any ordinary centrepiece. Posh, elegant, opulent, ritzy, swank, luxury are some words that come to mind but epergnes can also be modest and endearing too. Click on the thumbnail picture below to watch the video on YouTube.